Iron ores. A natural mineral formation containing iron compounds from which iron is industrially extracted. Iron ores vary in their mineral composition, iron content, amount of useful and harmful impurities, and industrial properties. Their main types are classified according to their dominant mineral compound and geological formation. 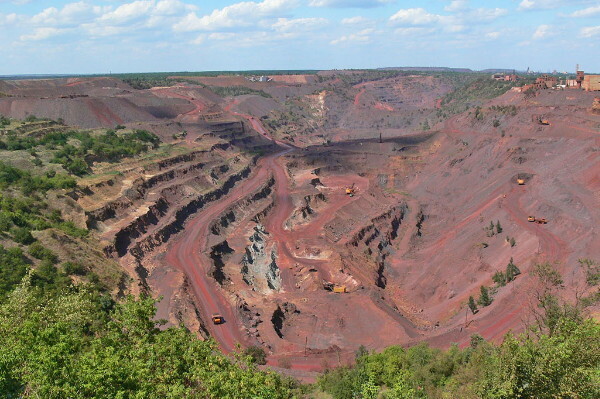 The ores found in Ukraine are hematite (Fe2O3), magnetite (Fe3 O4), siderite (FeCO3), brown and bog iron ores containing hydrous ferric oxides (Fe2O3.nH2O), and ferruginous quartzites. For industrial purposes a distinction is made between poor and rich ores, the latter containing more than 46 percent iron. When high-grade ores are inaccessible or exhausted, it becomes necessary to separate and discard unusable materials from low-grade ores. The processes of upgrading are termed beneficiation and are accomplished by leaching and drying, flotation, agglomeration, or magnetic separation. Harmful impurities, such as sulfur, phosphorus, and arsenic, may degrade the quality of an ore, necessitating the addition of different ores in order to prepare it for industrial use. The mixture of manganese, chromium, nickel, titanium, vanadium, and cobalt is usually beneficial.